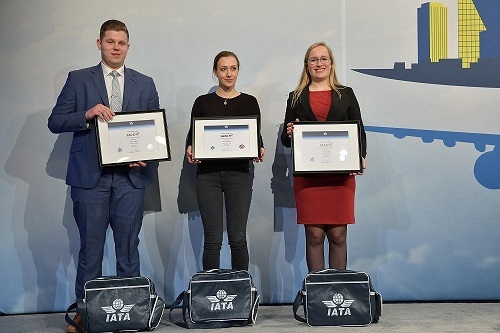 Geneva – The International Air Transport Association (IATA) announced that Femke Sickler a recent graduate of Delft University of Technology in the Netherlands was the recipient of the IATA FACE-UP award for 2018. FACE-UP is a competition for recent university graduates whose thesis is on the subject of innovation and transformation in air transport logistics (e.g. air cargo, supply chain management, mobility, IT solutions, etc.). Sickler’s thesis addressed improving the air cargo value chain with regard to the acceptance process, trucking schedule and data communication. The award was presented at the 12th World Cargo Symposium (WCS) in Dallas. A senior panel of judges from across the industry selected three finalists who presented at the WCS closing plenary for the audience to nominate the ultimate winner of the FACE-UP competition. The finalists were selected based on showing innovation and also the potential to transform air cargo. Danny Jonker (Maastricht University) and Caroline Larisch (Maastricht University) made up the trio of finalists. The biennial IATA FACE-UP competition is the first installment of its kind. The initiative is part of IATA’s Future Air Cargo Executives (FACE) Program which was launched in 2013 with the aim of attracting, retaining and developing a bright and diverse pool of young talent, preparing them to become the next generation of leaders in the cargo industry. Watch this video to find more information about the IATA FACE-UP competition.